This is a dish that I will most likely not be making again, I am sorry to say. I am especially sorry to say it because the recipe came from one of my favorite bean cookbooks, Jay Solomon's Lean Bean Cuisine. It is the first recipe I have tried from the book that did not wow me. To be fair, it may not be the fault of the recipe. The herbs and spices that flavor this dish is a combination that I have discovered does not suit my palate. Dishes that have a high proportion of paprika (without some kind of acid for balance) translate to a mustiness on my palate. While there was nothing particularly wrong with it, it did not overwhelm me. I am surprised that I didn't like it more, given how much I like all of the individual ingredients. I will not make this again, but I will certainly make other dishes with these ingredients. I will just flavor them differently. If this recipe looks good to you, though, I would say it is worth trying. Chacun à son goût. A note on the beans: You can cook them (as I always do these days) using the no-soak method I wrote about here. Place the beans in a saucepan, add plenty of water to cover, and cook for 1 to 1-1/2 hours, until the beans are tender. Drain, reserving 1-1/2 cups of the cooking liquid, and set aside. In a large saucepan, heat the oil and add the onion, garlic, and paprika and saute for about 5 minutes. Add the tomatoes and seasonings and cook for about 10 minutes more, until the mixture is a thick pulp. 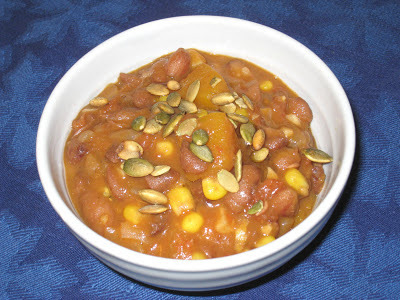 Add the beans, reserved cooking liquid, and squash and cook for 15 to 20 minutes, stirring occasionally, until the squash is tender. Stir in the corn and return to a simmer for a few minutes. Serve the stew in bowls with rice on the side.